I love the way in which the peacock parades through this paisley design by Melbourne label Yum Plus One! Designer Eduardo Wolfe-Alegria has incorporated the decorative paisley pattern into a striking graphic image. 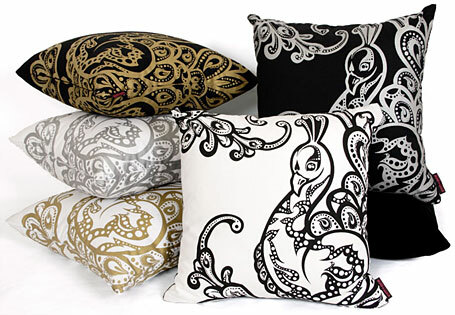 With their bold prints and dramatic colour contrasts, these cushions will add a touch of drama to your living room. 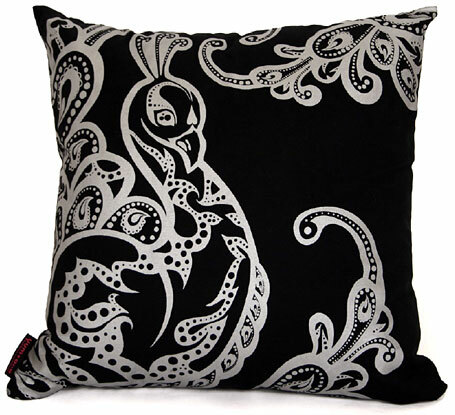 Pictured above is The Peacock in Paisley, a 50cm x 50cm cushion featuring metallic gold hand screen-printed on black cotton canvas (front & back), available from Yum Plus One for AUD $80. More colour options are pictured below, and also available is a 50cm x 28cm cushion for AUD $50. Yum Plus One was launched a couple of years ago by two friends: designer Eduardo Wolfe-Alegria and marketing manager Brad Korff, who share a desire to break down the barriers between art and design. Inspired by a range of influences including Art Nouveau, 1960s and 70s pop, Japanese design and 1920s fashion illustration, they aim to add fresh new flavours to the world of interior decorating and design. The Yum Plus One line up incorporates four ranges: A Paisley Paradise, Butterfly Blossom, The Peacock in Paisley and Utopia. 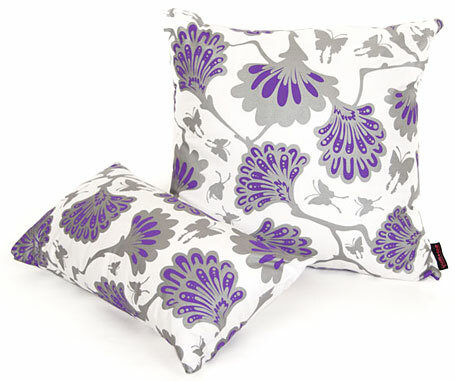 The cushions pictured above are from the Butterfly Blossom range and are titled "Spinning". They are printed in metallic silver and purple on white cotton canvas (front & back), and both are available for AUD $80 each. Pictured below are dizzying designs from the Utopia range. 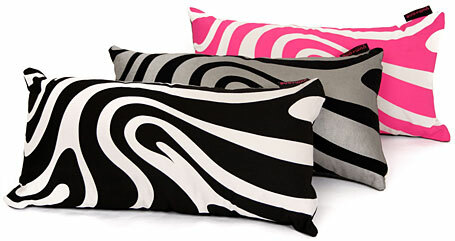 "The Swirl" is available in three eye-catching colour combinations, each for AUD $50. VIC: Meli Interiors (Richmond), Pash Interiors (Fitzroy), Crowded House Design (Malvern). and of course from the Yum Plus One web site at www.yumplusone.com.au.